The Confederate regiments listed in the menu to the left included significant numbers of soldiers from counties in what is now West Virginia. 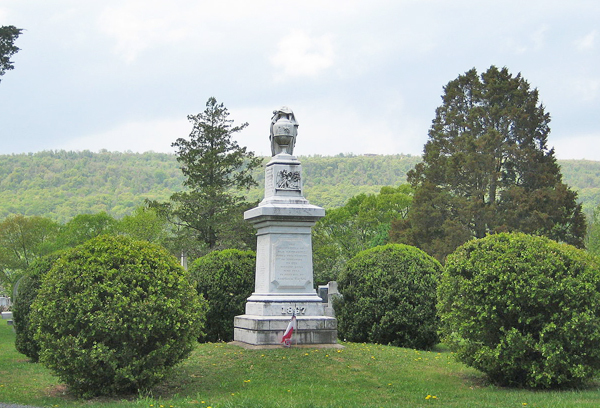 The Confederate Memorial (also referred to as the First Confederate Memorial) is a memorial in Indian Mound Cemetery in Romney, West Virginia. The memorial commemorates residents of Hampshire County who died during the American Civil War fighting for the Confederate States of America. The memorial was sponsored by the Confederate Memorial Association, which formally dedicated the monument on September 26, 1867. It is thought to be the first memorial structure erected to memorialize the Confederate dead in the United States. Romney also claims to have undertaken the first public decoration of Confederate graves on June 1, 1866.